Hello guys good morning. I just want to share this bad dream with you. Team Kurapika (Kurapika, Leorio, Senritsu) were riding on a hot air balloon while Gon and Killua are rushing to the mansion by foot. As the hot air balloon goes near the mansion, it exploded. Maybe it was taken down by one of the Spiders. Senritsu and Leorio made a wrong move and jumped into the veranda. Meanwhile, Kurapika went down with the burning hot air balloon but he was saved by Gon and Killua. The three watched at the next thing that happened. In my dream, I'm scared (as an audience) and at the same time excited in the part of the Phantom Troupe. Feitan alone could be very deadly for the two. At first, I'm scared of Leorio's fate but since he's one of the protagonist, I thought in my dream that he's going to be spared. 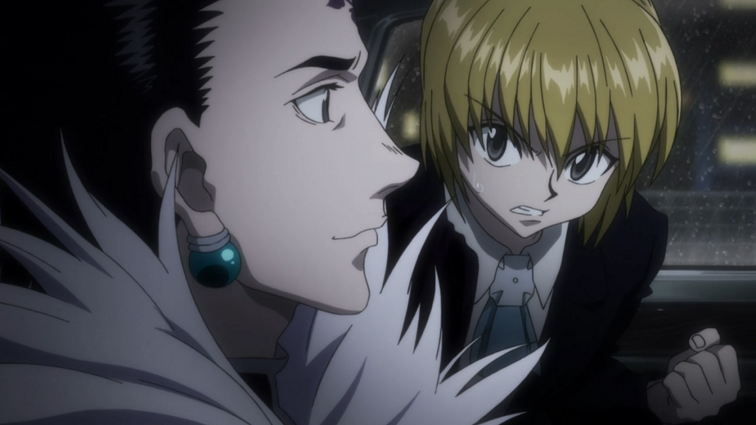 Leorio looked up and we've met eye to eye. After that, Feitan took out his sword and slashed. Gon, Killua and Kurapika cried out Leorio and Senritsu's name. I would presume that Leorio has been manipulated. That's what I'm thinking in my dream. Since Shalnark and I shares the same POV, that is the most possible thing to happen.